Welcome to our Douro Valley wine tour! We begin with a walking tour of Oporto, a lovely port town with baroque churches and tiled facades. We’ll hear why taxes and a war with France drove the British into the welcoming arms of the Portuguese, where they seized upon Porto as a viable replacement for embargoed Bordeaux. A river cruise follows, passing under 6 bridges, including one designed by Monsieur Eiffel. Lunch is on your own, perhaps at one of the dockside restaurants. 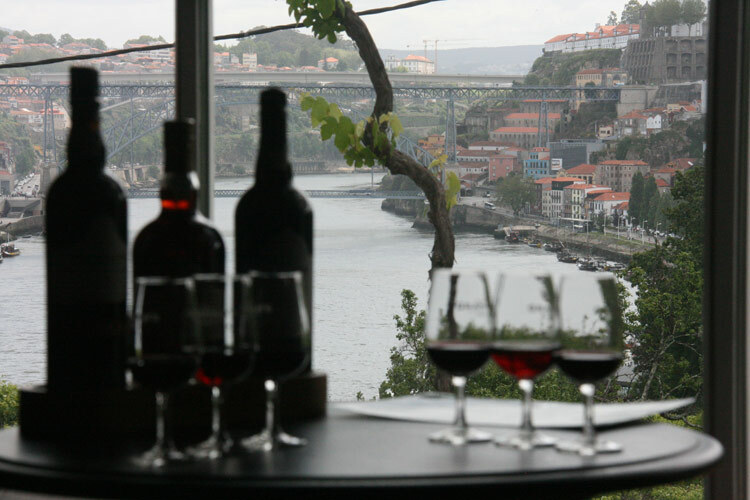 We then cross the river to Vila Nova de Gaia, where Port is aged in riverside lodges. We start our crash course in Port at Churchill’s, one of the newer British port companies (f. 1981), where we’ll taste in style in their newly inaugurated visitor’s center. Dinner at an elegant river-view restaurant introduces Portuguese cuisine, which includes such dishes as kale soup (caldo verde), chouriço sausage, sucking pig (leitâo assado), and 365 versions of codfish (bacalhau). 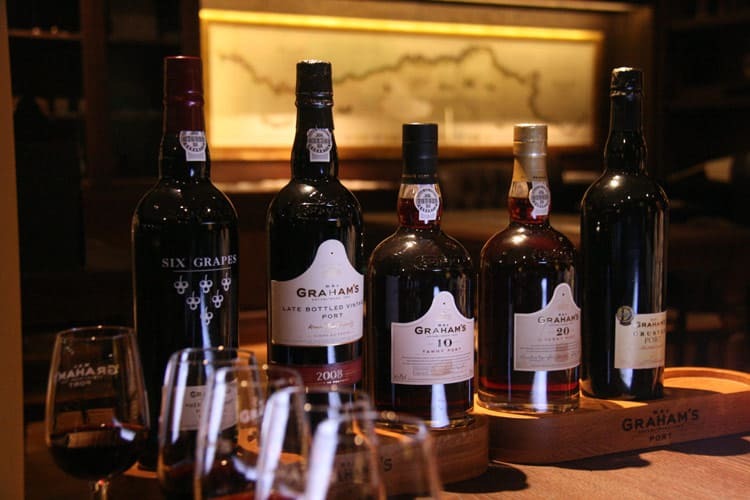 This morning we visit Graham’s (f.1820), where we’ll delve in the styles of Porto and learn the differences between ruby, tawny, late-bottled vintage (LBV), and vintage. Here we’ll see the various aging methods, including cigar-shaped barrels called “pipes” for tawny and massive oak casks for ruby. Tasting two flights of Graham’s rubies and tawnies will then help crystallize the lesson. Lunch will be in Vila Nova, either at Taylor-Fladgate’s classy restaurant or at a more informal brew-pub on the river. Our second stop is the wine museum of Ramos Pintos (f. 1880), which showcases the early days of Port. The Ramos family pioneered the marketing of Port to new international markets like Brazil—and the use of racy images in advertising! José Ramos Pintos Rosa became known as “the Pope of the Duoro” because of his pioneering experiments in viticulture and mechanization. His research, together with current winemaker João Nicolau de Aldeida, helped determine the top five grape varieties in the Douro. You can either linger in Vila Nova and visit more tasting rooms on your own, walking back to the hotel. Or we can shuttle you directly. Dinner on your own in Oporto. Port is aged in Oporto, but its grapes are grown 90 miles upstream. 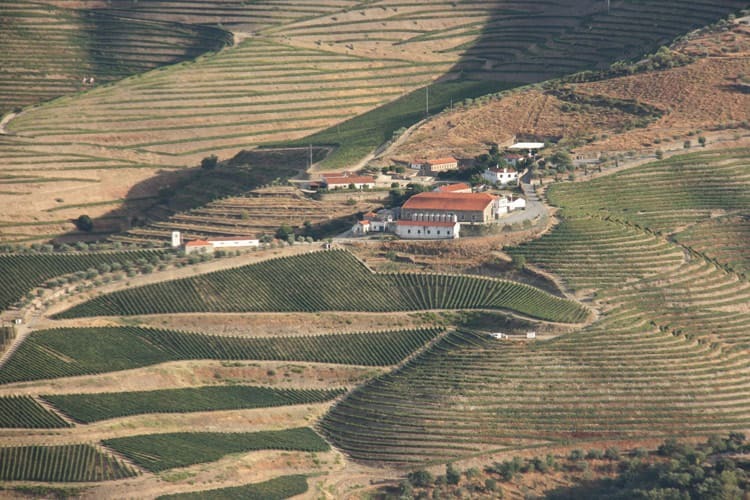 In the morning, we drive up the Douro Valley to the Cima Corgo, where many of the finest vineyards lie. Then we visit the historic Quinta do Noval (f. 1715), which lays claim to the creation of the LBV style of Port and also crafts its exceptional Vintage Nacional wine from ungrafted, pre-phylloxera vines. Tonight we settle into our second hotel, which is also a winery, Casa de Casal de Loivos, perched high above Pinhão. Dinner is in town. The Douro is a UNESCO World Heritage Site, and today we’ll soak up its awesome beauty. The occasion is a scenic train ride from Pinhão to the Douro Superiore, the driest, hottest, and most remote region for Port grapes. We’ll take the train to Pocihno, the eastern terminus of the Douro railway, just shy of the Spainish border. (There’s nothing to see in Pocihno, so we’ll have 40 minutes to kill at the station before our return trip.) For lunch, we’ll eat with the locals in Pinhao. DAY 6 – BOA VIAGEM! Porto (continental) or Lisbon (intercontinental). If flying into Lisbon and spending a few days there, you can take a train to Porto in 3 hours (see below). To get from the Lisbon airport to the city center, there is an airport shuttle bus. In Porto, your best option is a taxi. There is also a subway system; the E line has its final stop at the airport (“Aeroport”). For an overview of transit options, see GoOporto. Lisbon has three train stations. 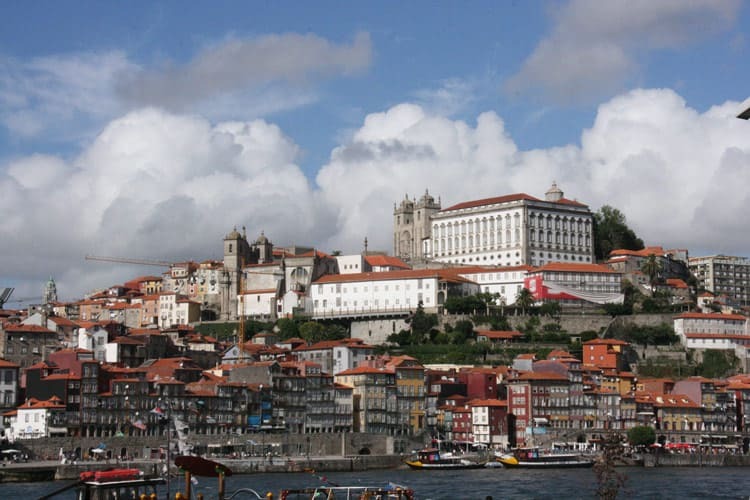 To go to Porto, you’ll be using either Lisbon Santa Apolonia (located in the city center) or Lisbon Gare do Oriente (2 miles from the airport). It’s 3 hours from Lisbon to Porto (station name: Porto Campanha). See the CP train schedule in English. Lisbon is Portugal’s capital city and offers plenty to see and do. For a basic orientation, see GoLisbon. Plan to land in Portugal at least a day before the tour begins. We recommend spending the preceding night in Oporto in order to be at our meeting spot on time. In Oporto, the most convenient hotel choice would be the one we’re using on Day 1, the Pestana Porto (we can make the reservation for you). Alternately, there’s a variety of 3- and 4-star hotels in the city center. If not staying at the Pestana, you will be responsible for arriving there on the morning of Day 1 in time for our pick-up. On our final day, we’ll have you back to Oporto (airport or city center) by 1 P.M. Drive time from Pinhão is approximately 3 hours. When packing, check www.weather.com. Go to “Porto, Portugal” and “Vila Real, Portugal” to get a general idea of temperatures and forecast. Available as a private, custom tour in 2019. Minimum 4 people. Offered alternate years on the public calendar, so it will return there in 2020. Price based on this 6-day itinerary for 4 pax, double occupancy; discounts for larger groups. Modifications are possible, including the number of days, level of accommodations, amount of wine tastings, and inclusion of meals.